Representatives from the Yellow Vest movement have said that a temporary suspension of a further tax increase by the government does not go far enough, maintaining the taxes should be cut altogether. The government of Emmanuel Macron will announce Tuesday morning a moratorium on the increase of the fuel tax, slated for January 1st, according to government sources speaking to franceinfo and confirmed by Agence France-Presse (AFP). The freeze on taxes is believed to last several months, with Prime Minister Édouard Philippe also set to announce other measures in an attempt to appease protesters. The union of students, which took part in solidarity protests on Monday, also said that the temporary tax rise halt did not go far enough. The French have seen a 14 per cent rise on petrol (gas) and 23 per cent rise on diesel in the past 12 months, as part of the progressive president’s plans to force renewable energy onto citizens by increasing carbon taxes. 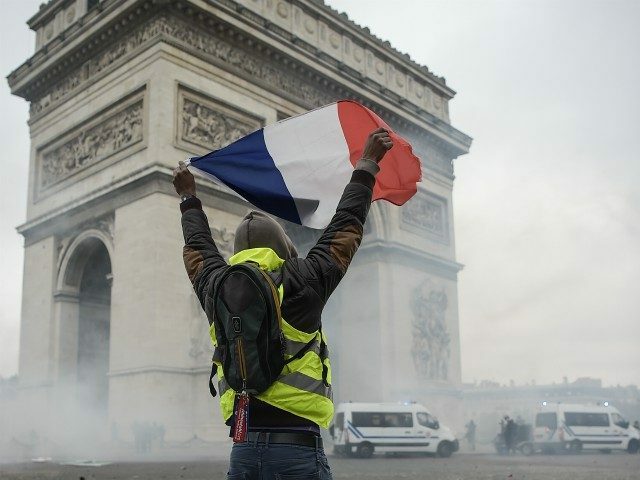 The tax hikes sparked protests across the country that began November 17th by individuals donning hi-visibility jackets — symbolising French drivers — with the movement evolving to include other groups protesting Macron’s progressive reforms and the cost of living. While Macron’s party, La République En Marche! (LREM/Republic on the Move) has said that such a moratorium would be “healthy” and that it was necessary “to appease the country,” the political opposition is not satisfied. Populist-right Nationally Rally leader Marine Le Pen said it was “obviously not up to the expectations” of the French public, 72 per cent of whom back the Yellow Vests even after protests had become violent and destructive. The right-wing establishment Republicans’ leader of senators Bruno Retailleau also said, “This is a proposal that is well below what the yellow vests movement” expects, and demanded “a cancellation” of tax hikes altogether, according to Le Monde. On Monday night, President Macron held crisis talks at the Élysée Palace, the official residence of the President of France, with a dozen ministers, including ecology minister François de Rugy and economy minister Bruno Le Maire. Another Yellow Jackets representative, 51-year-old Jacline Mouraud, told France’s BFMTV that she decided not to go to the Hôtel de Matignon, the official residence of the Prime Minister of France, after allegedly receiving “threats” against her and her children.